At the Craig Newmark Graduate School of Journalism at the City University of New York, change is in our DNA. That comes of being born in 2006, as the digital revolution was transforming our profession in ways none of us could have imagined. We fashioned a school to teach the latest storytelling, entrepreneurial, and technological skills alongside reporting, writing, and ethics. Beyond that, we’ve crafted a culture that spurns complacency, that isn’t afraid to pivot before the ground under us shifts. 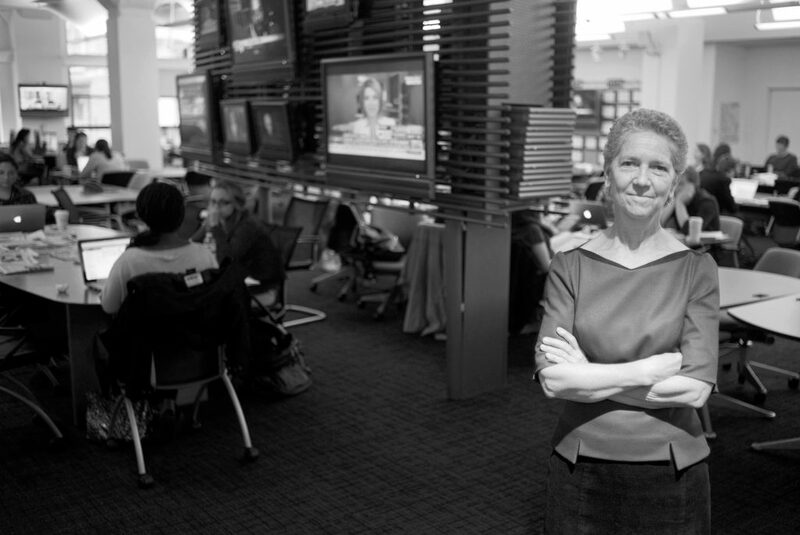 Dean Sarah Bartlett in the Newmark J-School newsroom. We are the only publicly funded graduate journalism school in the heart of the media capital; indeed, in the entire Northeast. Our mission is to serve the public interest – by training new journalists who will bring much-needed diversity to newsrooms, by helping mid-career journalists retool their skills, and by partnering with other media organizations to find new paths to excellence. Our low tuition rates, along with the added backing of private donors, allow candidates for our three master’s degrees — in journalism, entrepreneurial journalism, and social journalism — and our Advanced Certificate in Entrepreneurial Journalism to receive a world-class education at an affordable price. Our three media centers provide research, training, thought leadership, industry meet-ups, and financial support for quality journalistic work. We also offer a robust professional education program through regular evening and weekend workshops. And we support in-depth reporting projects of professional journalists through fellowship grants. Classes are led by accomplished full-time faculty and adjuncts, who tap their networks to help students and graduates find internships, freelance opportunities and — the ultimate prize — jobs. At a time when our profession is reeling from financial pressures and lack of trust, the Newmark Graduate School of Journalism is committed to producing the next generation of skilled, ethically minded, and diverse journalists. We invite you to be part of our world. When students walk into the Newmark J-School, they become staff reporters for the NYCity News Service, a multimedia outlet that feeds stories to professional news operations of all types and sizes. The News Service, which has earned more than 100 local and national journalism awards, also produces in-depth special reports. AudioFiles: Our fall-semester series of podcasts brings the sounds of the city to life. 219WestTV: Our TV news magazine, which airs on CUNY TV, tells only-in-New York stories. Mott Haven Herald: Our newspaper and website covers the Bronx’ Mott Haven, Melrose and Port Morris neighborhoods. NYCity Photowire: Our picture-driven platform spotlights photographic coverage of New York. Voices of NY: Our in-house site, highlighting the best of the city’s community and ethnic media, welcomes student pitches. We are rooted in the core skills and ethics of journalism: strong reporting and writing, critical thinking, fairness, and accuracy. We teach new technologies and storytelling tools across media platforms to engage audiences and promote a broader democratic dialogue. We serve our local and global news communities by sharing our reporting, research, and facilities. We serve our profession by graduating skilled journalists, diversifying the voices in the media, and encouraging innovation and entrepreneurship to help build a sustainable future for journalism. * As part of the Graduate School and University Center at CUNY, the Newmark Graduate School of Journalism is seeking Middle States reaccreditation. Learn more on our 2020 Middle States Reaccreditation Review web page. Separately, the Newmark J-School will also be seeking ACEJMC reaccreditation in time for a 2020 deadline.